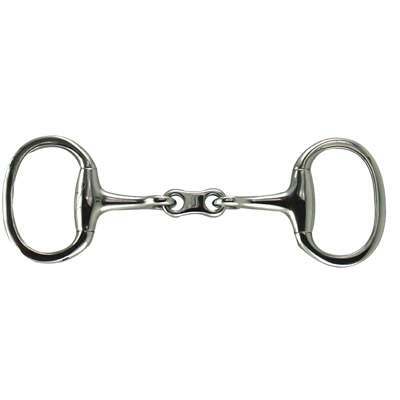 Looking for a French Link Large Flat Ring Eggbutt Snaffle Bit which is durable and affordable? You came to the right place. Here at Horse Tack Now we have a nice selection of Eggbutt Snaffle Bits for you to choose from. This particular Flat Ring Eggbutt Snaffle Bit has extra control as the bit fits to the shape of the mouth and gives the horse more mouth space. The link also reduces the snapping action between the rings and the mouthpiece. This Eggbutt Snaffle Bit measures 3'' in the rings and 13mm mouth. It is made of pure solid stainless steel and will last a lifetime. So get yourself a nice set of Horse Snaffle Bits today. When buying from us you can rest assured you will be purchasing a great product.